SOUTHFIELD – RAPID + TCT, the largest 3D printing exhibition and conference in North America, is returning to Detroit to showcase the growth of additive manufacturing in the heart of industrial America. 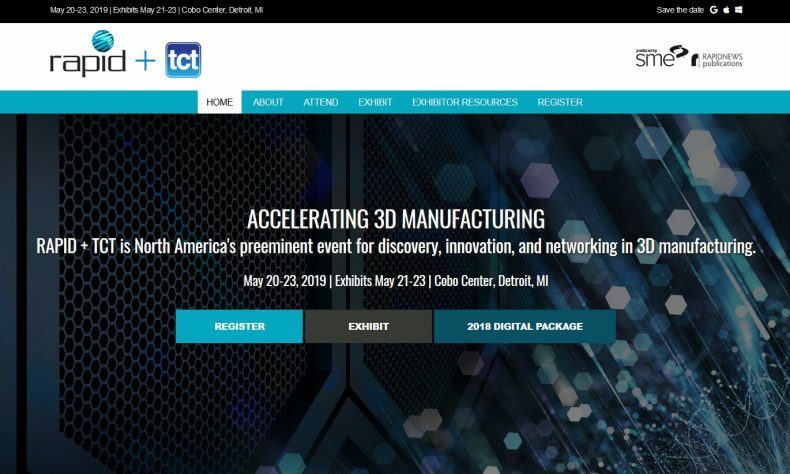 The event, produced by Dearborn-based SME, formerly the Society of Manufacturing Engineers, and Chester, U.K.-based Rapid News Publications Ltd., owner of The TCT Group, is scheduled for May 20-23 at Detroit’s Cobo Center. Organizers say the event will gather the world’s leading companies to demonstrate the most advanced innovations in additive manufacturing. Attendees will have the opportunity to experience more than 300 hands-on exhibits, along with product announcements, education from highly regarded experts, and networking with an expected 6,000-plus industry peers. The 2019 event already boasts involvement from major additive manufacturing equipment companies, such as HP Inc., Stratasys, Desktop Metal, GE Additive, Trumpf North America, Titan Robotics and Cincinnati Inc., among many others. Organizers noted that the auto industry is one of the biggest users of additive manufacturing, making Detroit the perfect place to host next year’s event. As automakers increase their use of additive manufacturing, they will look to the supply chains to follow or even lead innovation in this area. To learn more about the event or to attend, visit rapid3devent.com. More about SME at sme.org. Established in 1992, Rapid News Publications offers events and media products, including TCT awards, events, and research, in additive manufacturing, 3D printing, and design and engineering technology. More at www.thetctgroup.com and www.rapidnews.com.